If you have been reading along for a while, you know that our family has lived all around the world, in a variety of great places. This nomadic lifestyle introduced us to vegetables, fruit, spices and other ingredients that we grew to love and adopted into our family meals, but when we moved on, sometimes those items weren’t available in the next place and we had to do without. Mourning the loss not just a little. With the advent of catalog shopping, the world got a little bit smaller. When I posted my recipe for potato curry, I went on about Madhur Jaffery’s Spice Kitchen cookbook, and how I came to own curry spices again in Brazil, so I won’t tell the story again here. But I will show you a photo of the little containers those spices came in because I remembered to take a photo this summer. Empty now, and a little bit rusty, they live on the small shelves over my sink in Houston and their bright colors make me happy, even when I’m washing dishes. Anyway, this tomato chutney recipe is adapted from that same well-worn, food-bespattered book. It makes a great gift for neighbors and relatives but I always have a couple of jars on hand for personal consumption. 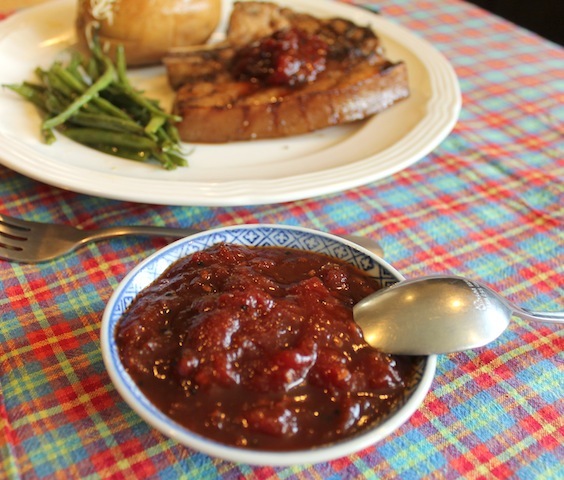 Tomato chutney dresses up a plain grilled chicken breast or pork chops like nothing else can, with a hit of sour, sweet and spicy. But most importantly to our Sunday Supper theme today, it preserves a bumper tomato crop for enjoyment year round. Our host for today’s event is Heather from Hezzi D’s Books and Cooks and we have some fabulous recipes for you that will keep summer in your cupboard or freezer for many months to come. Measure your spices out so that they are ready for adding to the pot in a hurry. Cut the brown ends off of your garlic and peel and coarsely chop your ginger. Put the garlic, ginger and 1/2 cup of the vinegar into the container of an electric blender and blend at high speed until smooth. Halve the fresh tomatoes and cut out the hard cores. Pretty summer tomatoes from the UAE. Yes, farms do grow things in the desert. Heat the oil in a 4-quart, heavy-bottomed pot with non-metallic finish, over medium high heat. When hot, add the mustards seeds. As soon as they start to pop – this takes just a few seconds – add the fenugreek, cumin, fennel and kalonji. Stir once quickly and add the paste from the blender. Stir paste for one minute then add the tomatoes (and juice from the can, if using,) the rest of the vinegar, the sugar, salt and cayenne pepper. Bring to a boil. If such things matter to you, feel free to pick the skins out of the pot with tongs as they become detached from the tomatoes. Some can be rather thick so I do pick them out when I have that type of tomato. Otherwise, I leave them in. Lower heat a bit and cook, uncovered, over medium heat at first and then, as the chutney thickens, on increasingly lower heat for about 1½ - 2 hours or until chutney becomes thick. Stir occasionally at first and more frequently as it thickens. Pour chutney into sterilized jars while still boiling hot, putting a metal teaspoon in each jar to keep it from cracking. Remove the teaspoon and screw the lids on tightly and turn jars upside down until they are cooled. When the jars are cool, you can turn them upright and the vacuum seal will pop in, keeping the chutney fresh for months in a cool dry cupboard. If the seal doesn't pop back in, store the jars in the refrigerator. 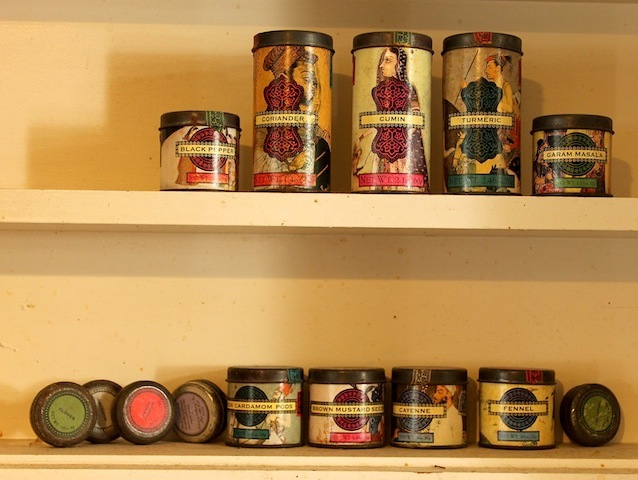 If you are giving it as a gift, by all means, make and print a pretty label. Want to continue to enjoy the season’s bounty all year long? Have a look at the wonderful Preserving the Harvest recipes we have for you today. My mind is filling with so many ways to use this lovely chutney. Looks like I'll be buying a bunch of tomatoes at the farmers market so I can make it. The deep red color of your chutney is gorgeous. I love eating chutney of so many different foods and this sweet and spicy version sounds awesome! Yum! I love this recipe and it's such a great way to use up all those tomatoes in the garden! oooh this looks so delicious! I haven't done tomato jam in years! I do have to ask though, what's kalonji? I've never heard of it - is it similar to something else? It's also known as nigella, Lauren. Perhaps you'd heard of it by that name? Have a look at my photo of the ingredients. The kalongi or nigella seeds are the tiny little black things in the little blue bowl on the left side. You can also see them like scattered black freckles in the last cooking photo. Thanks, Liz. Madhur Jaffery was raised in India but is considered the grande dame of Indian cookery in the UK. I love all of her recipes. It is indeed, Jennifer! I make this whenever I have gift tomatoes or can buy a bunch cheaply. Sadly, I can't grow my own here. Thank you, Heather. We eat it on everything too! It's the best, Renee. I hope you do get to try it! Your chutney looks amazing! The spices sound wonderful! Oh, I recently had the most amazing tomato chutney-type thing at a restaurant, and I've been thinking about it ever since. Thanks for this great recipe! That looks wonderful! I've never eaten or made chutney but I can see I definitely need to do so! G'day! I have ALWAYS wanted to make my own chutney, true! Based on your recipe and step by step photo, I am going to put this on my list to do! Thank you! Thank you, Shannon. It's been a family favorite for a long, long time. Thanks, Joanne. I hope you like it as much as we do. Based on something you said on your blog I am thinking you are from around Albany. You might want to shop at Parivar Spices http://www.yelp.com/biz/parivar-spices-and-food-albany or India Bazaar http://www.yelp.com/biz/india-bazaar-albany. Most welcome, Lori. Funny how certain things we come across in restaurants can occupy a small section of our thoughts until we get to go back or duplicate them at home. I adore Madhur Jaffery. Her recipes, her cookbooks and especially her memoir, "Climbing the Mango Trees." Have you read it, Ishita? Glad to hear that it's not just we westerners who love her cooking. Your approval counts for a lot in my book! Oh please! No, I haven't read this. But I love her. So must pick up a copy. This looks so good! We're hoping to have a good tomato harvest this year, so I will definitely be trying this! I use the upside down canning method too! So much easier for small batches than standing over a hot water bath! I'd lend you mine but it's on Kindle. But you must read it! Thanks! Parivar is right around the corner from me and I bet they'll have it - they have tons of awesome stuff. I'm always looking for a excuse to experiemnt with new flavors! Great tips and a beautiful chutney - my dad would love this so I will definitely make it! Thanks, Katy! I hope he enjoys this one as much as we do. You know I never ate a lot of chutney until I married my husband. It is so common to put chutney on lots of things but especially sandwiches here in the UK. Now I can't imagine a sandwich without either a tomato or onion chutney. I keep meaning to make my own but never seem to get around to it. I can't wait to give your recipe a try. I completely understand, Laura. Married to a Brit myself and Branston Pickle is a must have on any and every sandwich. We have carted it around the world in suitcases when it wasn't available where we lived. Do give the tomato chutney a try and I hope you like it! I LOVE spicy tomato sauce - with everything. Is that bad? Thanks for the upside down tip I haven't seen that before. I need to give this a go. This one is sweet and sour and spicy, Nancy. That's why I love it. You are most welcome.